Available in three opening profiles (Parallel, Casement, Awning). Insert in to FW 50 Curtain Wall. Seamless integration in to exterior Curtain Wall giving a streamlined aesthetic. Suitable for clerestories where ventilation is required but cannot be reached by hand. Available with fully concealed TipTronic automation. With their complete compatibility; Parallel Opening Units, Projected Top-Hung Opening, and Casement Opening constructions offer functional solutions for opening units in Curtain walls, sloped glazing and skylights. These also fulfil the highest requirements for optimum thermal insulation. Stepped glass appears to be frameless from the outside, but a sophisticated fitting system holds the glass in place from the interior. The Parallel Opening Window is a unique and innovative addition. This window opens as it’s name suggests, in parallel motion, providing just the right amount of ventilation. Unique Parallel Opening giving a clean look with easy ventilation. Parallel Opening saves interior space, no inward opening. 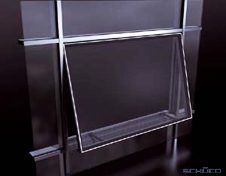 Appearance of frameless glass from the outside view. TipTronic automation is fully concealed. Elimination of corner leaks with vulcanized gaskets.